Present day: A major mob bust going down. The FBI pulls back surveillance, a killer flees. There’s slaughter in the ’burbs of Chicago; a murderer heads downtown. Why did he do it? Where is he going? Above all, what will he do next? Detective Wallace Greer and his partner, Romar Jones, are hot on the killer’s trail. They give chase through the Gold Coast and its tony restaurants, under the El in the East Loop, by Lake Michigan and the Chicago River, following the evidence, but always slightly behind; bodies mark the route. Five days in a cold Chicago winter. Motives collide. Psyches split. There’s no rest, no time; it’s all angles and action. They have to head off the killer, prevent killings too close to home. But can they catch him? Kill him? There’s only one way to find out. 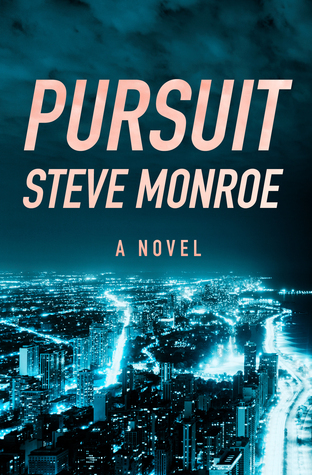 I really enjoy thrillers and fast paced stories so when I read the synopsis of Pursuit, I was really excited. I was a little unsure when I started it but after about 40 pages, I really started to get into the story. I really liked how this book was written almost in real time and how each chapter of sorts had a time. I think that was my favorite thing about this book. It really made the book seem even more fast paced. I couldn’t really connect with any of the characters. Mainly because the perspectives changed so much and so quickly. I couldn’t get attached to anyone before moving on to a new character. At times it was a little confusing because I couldn’t remember who some of the the characters were but I just went with it and after a while it all sort of came together. Overall, I enjoyed Pursuit. It was a quick read and a lot of fun. Even though I didn’t connect to the characters and was confuse at times, I liked the plot and writing. If you like thrillers, I’d recommend checking this book out.